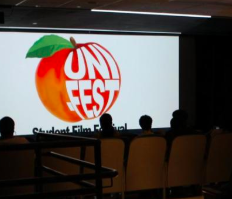 Two Georgia Southern University students won awards at the 2019 Uni-Fest Film Festival in Atlanta on March 30 and 31. The GS films screened at the festival were “NOSTOS 12” by senior multimedia film and production major, Connor Rentz, and “I Hate When Balloons Fly Away” by junior film and production major Madison Bunker and Jared Cobb. Rentz said that “NOSTOS 12” is an abstract science-fiction short film. Rentz directed, wrote, edited and co-produced “NOSTOS 12” alongside co-producers and co-directors of photography Logan Beever and David Besh. The film stars Rebecka Moreno, Franchette O’Neal and Will Besh. Rentz’s film won awards for best performance in a leading role, production design and best sound design. “Nostros 12” stars Rebecka Moreno. Moreno won best performance in a leading role. Rentz said he did the entire sound design from scratch and said that the majority of production of “NOSTOS 12” was filmed on campus with the help of his crew. “NOSTOS 12” is the ninth film that Rentz has made in his college career under his film and production company, Kyanite Pictures, Rentz said. The film premiered during the GS senior project two film screening last December and received high praise from students and faculty. Rentz directed, wrote, edited and co-produced “NOSTOS 12.” Rentz’s film won awards for best picture, best performance in a leading role, production design and best sound design. Rentz said that he watched many of the other films that will screen at Uni-Fest from other students around Georgia, and he is glad to have his film play alongside them. Madison Bunker and Jared Cobb’s film “I Hate When Balloons Fly Away’ were nominated for best directing and best editing. Their film is about a quirky romance, the idea of which came to him while he was doodling in class. “Jared and I were in class and I randomly drew a balloon with hair on it, and wrote ‘I Hate When Balloons Fly Away,’ and said [to Jared], ‘Let’s do something like this,’” Bunker said. The film itself is about a man who falls in love with a balloon, but another balloon threatens their relationship, Bunker said. Bunker worked closely with “Balloons” fellow writer, co-producer and director Jared Cobb to create the film. He also worked with theatre major Nick Parish, who stars in the film. Cobb’s sole co-stars of the film are balloons with drawn-on faces on them, which he completely commits to, Bunker said. Bunker said that having the film shown at the festival is all that really matters to him. “For us, it’s really about being able to showcase this strange little film that we concocted, and that people want to see it is good enough for us,” Bunker said. Both ‘I Hate When Balloons Fly Away’ and ‘NOSTOS 12‘ can be viewed on YouTube.